Cover large rimmed baking sheet with aluminum foil (for easier cleanup). Place rack on baking sheet and arrange bacon in single layer. 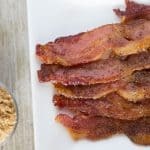 Gently rub brown sugar evenly over bacon, then top with pepper. Bake for 20-25 minutes, until desired crispness is reached. Then cool for at least 5 minutes.